Step 1: Inset the battery, process the start button, all symbols appear on the display, 1 second later it appears the temperature measured last time, the sign"M" appears at the same time. Step 2: The sign"M" disappear, forehead/ear indicator appear, it means the place you measured last time, then the temperature unit flickering, now is the measuring interface. Step 3: Direct the probe to measuring area, press the "measuring" button till a "Beep" sound from the speaker. Measuring program starts. Keeping device in position for one second after two "Beep" sounds, the temperature value will show on screen along with the model symbol. Step 4: During next 6 seconds when test result lasting on the screen, user can no longer make a measurement until a sound of "Beep" aural reminder and a symbol twinkling on the screen. Step 5: No operation in 60s seconds, the device will record the last measuring data and shut down automatically. Take off the forehead temperature cover. With the subject's head upright, take hold of the outer part of the ear, gently pull back and upward to straighten the ear canal, put the probe to ear canal slowly till the body of device stay completely close to ear canal. Do not take off the forehead temperature cover, locate the probe to midway of subject's forehead, stay close to skin. Pressing down "Power" button for 3 seconds when the device in off state, the unit will be switched between ℃/℉. Cautions: This operation is unable to recycle switch, turn off and operate as 3.3 again to switch the unit back. Themometer has fever prompt function. 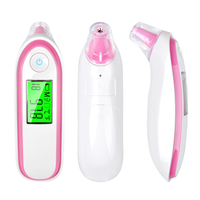 When body temperature is over 37.5℃ during measurement, the themometer will give out a long "beep" sound together with three short ones in order to remind the person who is under test that he/she gets a fever. At the same time, backlight of 3 different colors will indicate the state of temperature: normal, on the high side or fever.